Performance can be poor in the later game due to the increased save game size and the increased number of calculations that have to be performed. All versions require Steam DRM. The GamersGate DRM-free version is no longer being updated or supported. Steam version can be launched without Steam running. Now possible to play Muslim rulers. Able to restore The Roman Empire, expanded Orthodox religion and employable retinues. The Aztec Empire will invade across the Atlantic at mid to late game, unique culture and religion. Can now play as Merchant Republic, able to build trade posts and compete in new Doge election system. New bookmark set at the year 867. Now possible to play Pagan rulers and reform religion. Added raiding system for Pagan rulers. Now possible to play Jewish rulers. Revised Christianity with College of Cardinals for Pope election. Pope has new powers and can now donate to Holy Orders. Now possible to play as Indian rulers. Hinduism, Jainism and Buddhism as new religions with separate sects. Also adds a caste system. New bookmark set at the year 769. Introduced tribal holdings that offer a new unique playstyle. Rulers are now able to select one of ten focuses for ruler granting stat boosts and new events and decisions. Introduces new government type, "nomad". Adds The Silk Road trade mechanics. Expanded adventurers mechanics. The council now has more power and influences realm decisions. Revised the education/guardianship system. Added new "favor" mechanics. Improved illness and diseases, added hospitals, court physicians and province prosperity. Adds Societies you can join including demon-worshipers and monk orders. New councilor actions. Adds China as an off-map entity you can interact with. Overhauls gameplay with Christian and Pagan religions, adds dynastic bloodlines, Christian saints, Pagan warrior lodges and coronation ceremonies for royalty. Also adds the ability to start games with worlds shattered down to its duchies, or with the cultures, religions and names randomised. When playing multiplayer, expansions and some micro-transactions (customisation tools) that the host owns are made available to all clients for that session. A Game of Thrones: A full-conversion mod set in the world of George R. R. Martin's "A Song of Ice and Fire" (ASoIaF). Elder Kings: A full-conversion mod set in the Elder Scroll's world. Middle-earth Project: A full-conversion mod set in J.R.R Tolkien's legendarium. Listed as 'Multisample Level' in game. Options are 0, 2, 4 and 8. Locks to refresh rate set in video settings. Change this value to any number greater than 0 and less than or equal to 16 for varying degrees of anisotropic filtering. This doesn't actually do anything. This was confirmed by an official Paradox Employee. See Helix Mod: CRUSADER KINGS 2. All the console commands can be found on the Crusader Kings II wiki. Only some of the debug commands are listed below. Discretion is advised when using the console as it is very easy to cheat with it (adding/removing traits etc.). Console is disabled if playing in "ironman mode"
Press ~ (or the equivalent key above Tab ↹ on your keyboard) or Alt+Numpad 2+Numpad 1 in-game to enter console commands. If your activation code is too short for the code input box upon installation, fill the additional spaces with the character 'X', e.g. for a code formatted as AAAAA-BBBBB-CCCC you would input it as AAAA-ABBB-BBCC-CCXX-XXXX-XXXX. This is a likely cause of a game crash if your system only just meets the minimum system requirements to run the game. With such crashes, usually your graphics card will be at fault. One way to reduce stress on your graphics card is to turn off some of the more system-intensive options. This will prevent the game from rendering trees and thus significantly reduce the amount of information your graphics card has to process, in turn reducing the overall load on your system. 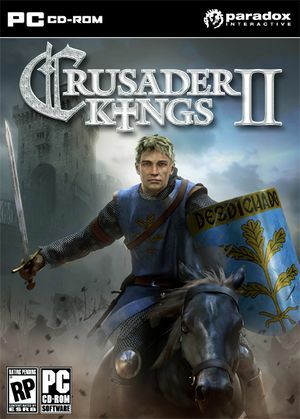 Your game version is given by "CK2 v<version> (<checksum>)" (for example, "CK2 v1.06 (YYEV)"). After entering a singleplayer or multiplayer game, it's possible for the checksum to change on some PCs (for example, to "CK2 v1.06 (ZYEV)"), while the others keep the same checksum. This won't allow you to play in multiplayer due to incompatible versions. Restarting the game fixes this problem. Most mods also change the checksum, so you may not be able to join the host if you do not have exactly the same mods (including same version) as the host. -mod=$MOD where $MOD is the filename of the mod you want to enable. -exclude_dlx=$DLC where $DLC is the filename of the piece of DLC you want to disable. A third-party free software launcher is available that does these things for you.